A New Zealand District Court made several major errors when it decided to grant the extradition of Kim Dotcom and his Megaupload colleagues, Dotcom's lawyer said today. Noting that the judge copy-pasted extensively from lawyers working for the U.S. Government, he argues that there is absolutely no legal ground to extradite Megaupload's founder. Last December a New Zealand District Court ruled that Kim Dotcom and his colleagues can be sent to the United States to face criminal charges. Judge Nevin Dawson found there was an “overwhelming” case for Dotcom, Mathias Ortmann and Bram van der Kolk, to be extradited. This decision was immediately appealed and last week a lengthy series of appeal hearings kicked off at New Zealand’s High Court. Represented by a team of lawyers, the Megaupload defendants say that Judge Nevin Dawson failed to give them a fair hearing. During the most recent hearing, which was live-streamed on YouTube, Kim Dotcom’s defense lawyer Ron Mansfield argued that the lower court made several errors in its final ruling. For example, it relied heavily on the writings of U.S. Government lawyers. According to Mansfield, the verdict included copy-pasted text from U.S. contributions to the record of case (ROC) on close to 60% of all pages. “At [156 pages of his 271-page judgment] the Judge has simply replicated in full passages from the US submissions on the ROC and asserted inferences,” Mansfield noted. “He has erred by failing to weigh the evidence and to determine whether the asserted inference is available and reasonable. He also fails to even seek to adopt the inferences promoted,” he added. Dotcom’s lawyer lists numerous errors allegedly made by the District Court, discussing them point by point while noting that not all U.S. evidence should have been taken at face value. In essence, the defense’s argument boils down to the question of whether the claimed offenses committed by Megaupload and its employees warrant extradition under the treaty in place between the U.S. and New Zealand. However, the copyright angle was also widely discussed. Dotcom’s lawyer highlighted that Megaupload was an Internet service provider. ISPs enjoy safe harbor protection and can’t be held criminally liable for copyright infringement. The High Court will have to make a crucial decision on this issue, he added, which will determine if Internet service providers can be held criminally liable for user generated content. This is crucial to other ISPs but also the public at large. “Ever since the printing press, the resultant copyright acts have achieved a careful balance between the competing interests of the content holder, new technologies that can be used to copy and the user,” Mansfield said. To reach a conclusion, the court will have to consider what ISPs’ obligations are when it comes to user-uploaded and distributed works, as far as copyright is concerned. “Do ISPs have a legal obligation to investigate and enforce copyright infringement, criminal or civil, by its users?” Mansfield questioned. “Ultimately, are ISPs responsible for user generated content? And, if so, how might that impact on the careful balance achieved by Parliament through the Copyright Act?” he added. 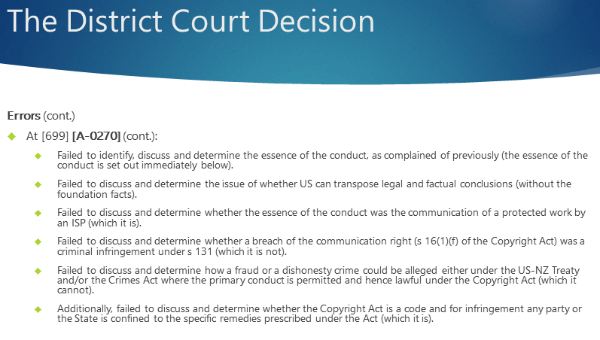 Even if the court disagrees that Megaupload and its employees are not liable for copyright infringement, the extradition request should be denied on the basis that copyright infringement is not an extraditable offense under the U.S. / New Zealand treaty. 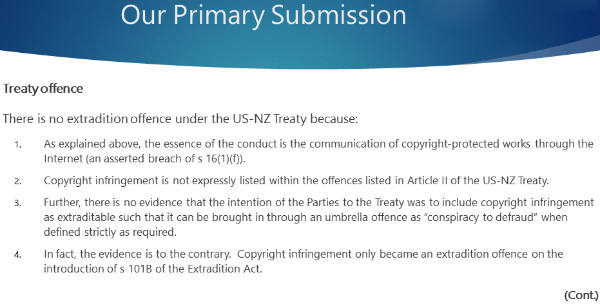 “There is no extradition offense under the US-NZ Treaty because….the essence of the conduct is the communication of copyright-protected works through the Internet,” Mansfield said. The hearing was just the first day for Dotcom’s lawyer, and many more will follow. The prosecution is likely to disagree with many points and while offering counter-argument, a process that’s expected to continue for several weeks. Kim Dotcom is aware of the stakes but is confident that the appeal will lead to a positive outcome. “I can’t see how any impartial judge can extradite me. The law is just simply completely on our side. There is not even space for interpretation. That’s how clear the law is,” Dotcom tells TorrentFreak. “But it’s a political case and there is a lot at stake for people in power. If I win they will fall as a result,” he concludes.